When I saw this interesting brush on the MyPure website I knew I had to try it. I have never been converted to BB/CC creams even though I own quite a few and I was hoping this brush would help change that. I find that BB/CC creams never apply as streak-free as a full foundation. In hindsight I am sure that I have always used my fingers to apply them (which for one thing isn't the most hygienic way of applying any face product) and have never seen a brush marketed as being specifically for helping with this. MyPure sells a big range of natural and organic health, beauty and cosmetic products. 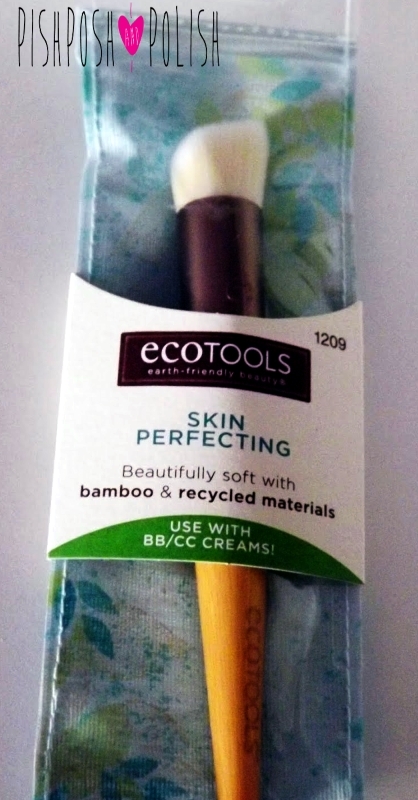 This EcoTools brush is made from a super lightweight bamboo handle and cruelty free bristles. It is really soft and easy to handle. The shape of the bristles is tapered very softly but it is still quite a high density brush which means it covers a bigger area at once but also is designed to fit into the creases around your nose for example. I found the best way to use this brush was like a stipling brush and to 'dab' on the product rather than brushing it on as it still continued to streak and look a little patchy otherwise. I found you also had to be careful not to overwork the BB/CC cream as it started to almost buff the product off my face. However saying this with a little practice I was able to use this brush perfectly well and it is a brush I keep reaching for when applying my makeup. In fact I would say that this brush makes a brilliant foundation brush- it works really well with my high density full coverage foundations and I have found that this is what I use this brush for most of all. While I haven't been converted fully to BB/CC creams yet I am slowly getting there and this is a well made, good quality brush. The natural and cruelty free nature of it is also a bonus and while I don't use it fully as intended I think this is a good brush for any beauty guru's arsenal. Great review on this brush!